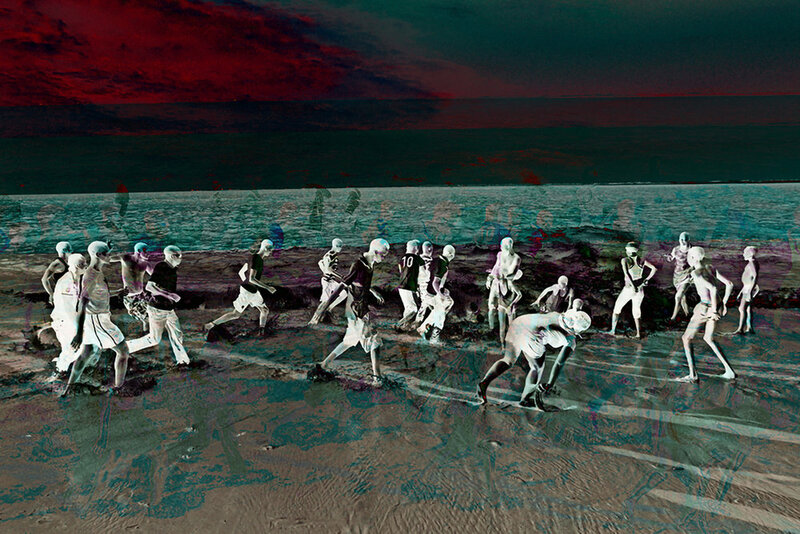 This series is called: “Ghosts of Bar Beach – bar beach was here!” My approach to image making is experimental. I conceive, orchestrate and deliver images so charged that one might experience their weightiness. The weightiness is achieved when the images resonate with their subject matter, and I refer to this as the cultural payload, an energy which provides cognitive and perceptual resonance. This series looks back at the now reclaimed Bar Beach in Lagos. It adopts a post documentary style to accentuate points of historic nostalgia. Bar Beach was once one of the most accessible and visited beaches in Lagos where revelers could horse ride, swim, play beach football and engage in picnic activities. Bar beach was closed, sand filled and gave up its ghosts for a new city on the Atlantic – “Eko Atlantic City”. The images have been remastered to pick up references to bar beach’s history of spectacle. These photographs are part of a Lagos narrative. Lagos seen from the distance is stable, safe and inviting. Lagos from the foreground is warm but edgy – wavering on the verge. The city experienced from the middle ground, can be distancing as characters in the middle ground can appear territorial. It is from this middle ground that I remastered these images. The grittiness have been transformed and the many unknown characters present themselves as desirable cultural ambassadors. To glamorize this middle ground is counter subversive - seeding change by altering the context from which we form lasting experiences of the city. In this series, I seek to add back the charm of the foreground, and the allure of the background to the mystique of the middle ground. I create these possibilities by fracturing my original photographs and then I begin layering, recoloring and manipulating until I arrive at the recreation, the point of resonance. The works are never complete until they can stand on their own and resonate their payload. Ade Adekola is a Nigerian-born contemporary artist. His early years were spent tinkering with cameras and electronics. He trained as an architect specializing in the design of responsive building systems in the late 80’s. Ade went on to study business administration leading to a career as a management consultant specializing in transformation and innovation. He spent several years in Silicon Valley where he witnessed the digital transformation of photography. At this juncture Ade started to explore the transformative power offered by photography innovation. His enthusiasm captured, his journey in experimental photography was born. Returning to Nigeria in 2005 his creative emphasis shifted; he started to create images that reframe and redefine the Nigerian Cultural narrative. As an image maker, photography is more his medium than it is his craft. His practice is aimed at conceiving, orchestrating and delivering images charged with cultural payloads which add weightiness and substance to his overture. Typical in his work is the use of vibrant and at times electrifying colours. He uses varied visual techniques to give an eerie, vibrant and strangely unworldly quality to his images. 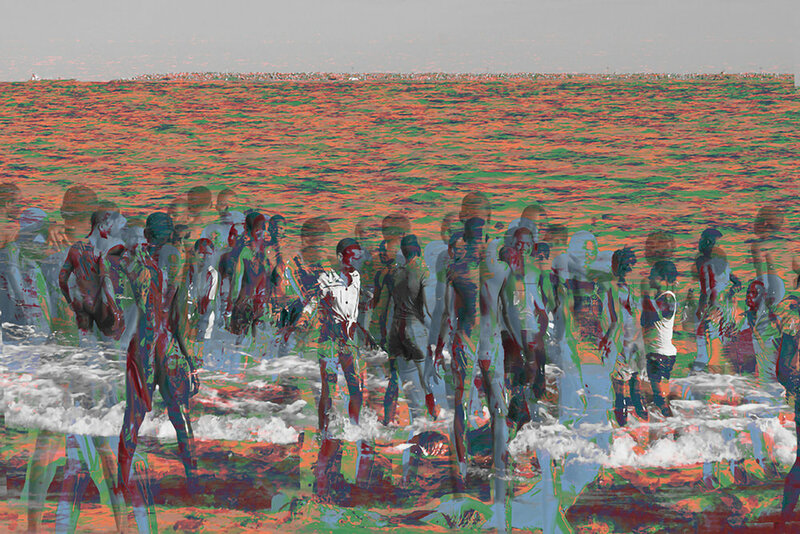 He produces his work in series and has realized over 30 series addressing wide ranging ideas and issues; many pose questions about shifting culture, migration, and globalization. His photography can be considered as performative; questioning the boundaries between individual and collective experience. He makes his artworks as think pieces that seek to tease the mind. His images are considered to elevate the visual plateau of Nigerian photography. Ade has exhibited as a conceptual artist since 1992 and has actively documented culture in the mega city of Lagos since 2005.